One of my good friends always says, “I covet that”. At first I made fun of her because she learned it from her boss twice her age, but now it is growing on me. Here are a few things I Covet at the moment. 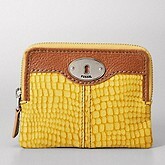 The Maddox Large Zip Pouch from Fossil – in yellow.